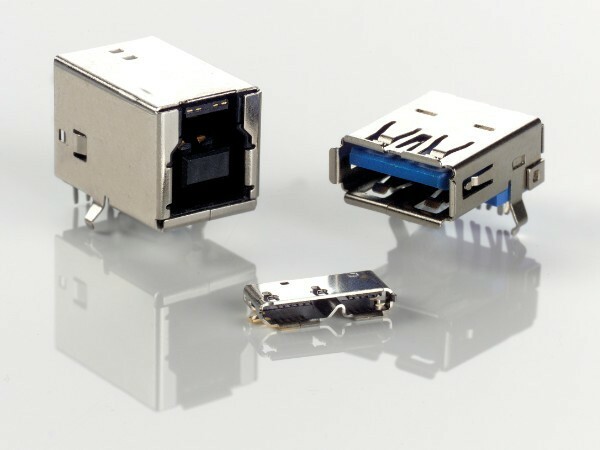 The USB (Universal Serial Bus) connector is a prime example of an I/O standard that has been constantly upgraded to remain relevant in a rapidly changing world. Originally designed for connecting host computers to peripheral device applications The latest iteration, USB 3.1 Type C has a communication speed of 10 Gbs. The USB (Universal Serial Bus) connector is a prime example of an I/O standard that has been constantly upgraded to remain relevant in a rapidly changing world. Originally designed for connecting host computers to peripheral device applications, USB 1.0 offered 12Mb/s transfer rates. In addition to specifying a compact, consumer-friendly 4-position connector, the USB standard features hot-swap capability and plug-and-play connectivity. Using the same interface, USB version 2.0 boosted the transfer rates to 480Mb/s. A key feature of USB 2.0 was its physical and electrical backward-compatibility with USB 1.0. SuperSpeed USB 3.0, with its 4th transfer mode specifies a maximum transmission rate of up to 5Gb/s with the added advantages of offering a full duplex link (allowing data to flow both ways between computers and peripherals) and enhanced power management. Type A plugs always face upstream, Type B face downstream. All USB devices (or peripherals) have an upstream connection to the host and all hosts have a downstream connection to the device. USB 2.0 plugs will fit into USB 3.0 receptacles but do not contain the extra wires needed to convey SuperSpeed communications. Note that USB 3.0 Type B plugs do not fit into USB 2.0 receptacles. A USB 3.0 device going to a USB 2.0 host, for example, will only work with a USB 2.0 cable assembly. Most larger USB peripherals (such as printers, scanners etc) have a USB Type B connector hence require a Type B plug. The latest iteration, USB 3.1 Type C has a communication speed of 10 Gbs. The Micro version is used in mobile devices like cell phones, PDA’s and Smartphones where the number of mateing cycles will be significantly higher. There are many applications for the USB 3.0 connectors. They range from Consumer to Automotive. The Series 690 USB connectors from EDAC, are fully compliant with the USB 2.0 and 3.0 specifications, providing a significant leap forward in transfer speeds (up to 10 Gbps signalling rate) and a 10x performance increase over hi-speed USB capabilities while maintaining backwards compatibility with USB 2.0 devices. The USB 3.0 specification will accommodate next generation peripherals that require more power and improved interaction between devices and the host computer by providing more power when needed and less power when not needed. A major new feature of USB 3.0 is the “SuperSpeed” bus, which provides a fourth transfer mode at 5.0 Gigabit/s. The raw throughput is 4 Gigabit/s, and the specification considers it reasonable to achieve 3.2 Gigabit/s (0.4 Gigabyte or 400 Megabytes), or more, after protocol overhead. The table identifies the differences between the 2.0 and new 3.0 technologies.